A little-used boat slip at a Port of Portland terminal north of the St. Johns Bridge is the most likely water-based site to stow contaminated Willamette River sediment. Slip 1 at Terminal 4 is a narrow inlet surrounded by land on three sides, making it relatively easy to wall off after sediment is piled there. The port owns most of the submerged property and seems willing to own and manage the confined disposal facility or CDF. It's the most fleshed-out proposal after the port commissioned a study that includes a partial or "60 percent" design. The other major contender for in-water disposal of contaminated sediments is the Swan Island lagoon. That confined disposal facility would be similar, but could hold more sediment, says Sean Sheldrake, EPA project manager. However, it's more complicated because there are numerous property owners. A third proposed CDF at the former Arkema DDT manufacturing plant appears less likely to win the EPA's blessing. 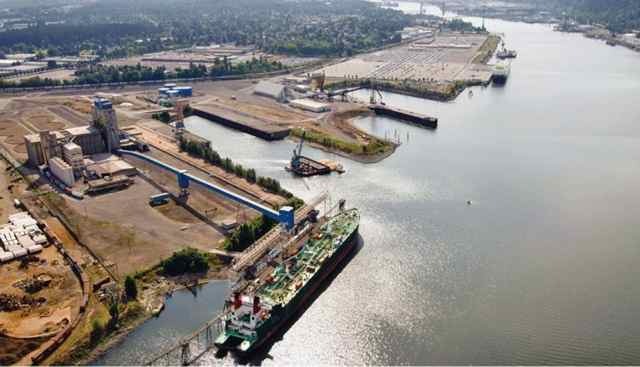 The Terminal 4 site could hold 870,000 to 970,000 cubic yards of sediment, says Kelly Madalinski, the Port of Portland's environmental program manager. Less than 10 percent would be contaminated sediment that is the port's responsibility to clean up, he says. The port would charge a fee to other responsible parties needing to put polluted sediment there. "By no means would this be a moneymaker for us," Madalinski says. Fees would offset some of the estimated $43 million to $63 million cost to build and maintain the CDF. The port also eventually might pave the site and get about 15 acres of usable land for other uses. That's a side benefit, but not the port's motivation to build the CDF, Madalinski says. The port estimates it could take four years to fill the site with sediment. Then the port would cover it with 400,000 cubic yards of sand or other fill material. Then it might take six to 12 months to cover it with gravel or blacktop, Madalinski says. However, the port is keenly aware that the idea is not popular among its North Portland neighbors.